Some research on the net quickly pointed out a moisture sensor from Vegetronix that measures both moisture and water level. It’s super easy to use, solidly built, won’t corrode (an almost inevitable fate for cheaper moisture sensors) and operates on very low effect. Perfect for me, except that they are a bit pricey @US$38 each. But WTF, YOLO and so on, they are the best. The soil probe delivers a voltage from 0–3 volts depending on how moist it is. I tossed in a simple protective circuit in front of on each input port; a voltage follower with a 3.3V Zener diode to ground that protects from over-voltage and a 1M pull-down resistor to ground that pulls down to 0V if no probe is connected. 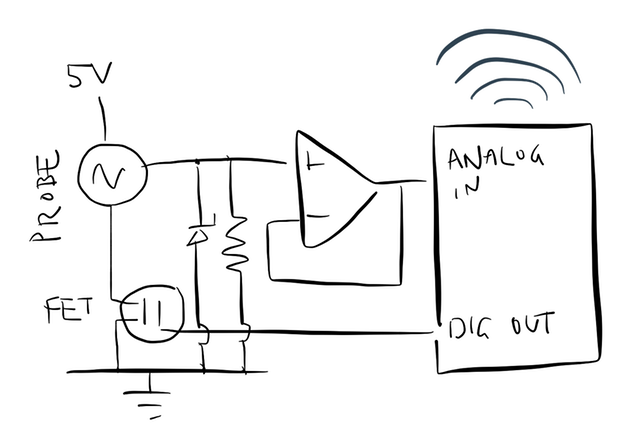 Then there is a N-type MOS-FET (horribly rendered in the sketch above) connected to an output pin on the imp. Setting the output to high will open the FET and get juice to the probes. 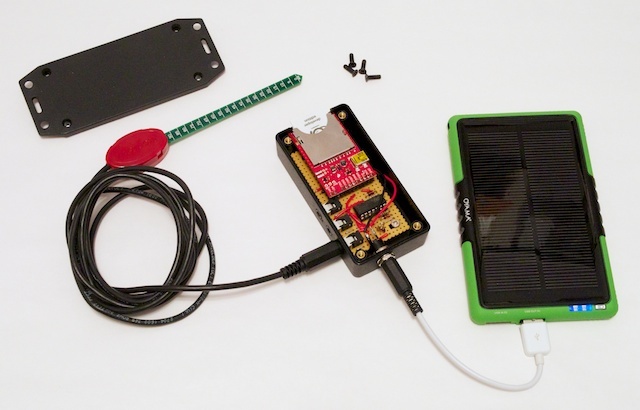 I squeezed everything into a little box and use a solar panel boosted rechargeable battery to provide power. The rest is software. Quite simple stuff, but I’m using parts of the electric imps API which still is in closed beta so I’m not allowed to show it until it’s officially released. Will update when possible. But basically, the imp wakes up at regular interval, measures, detects if there is a significant change and if so reports to the server part of the Imp solution. The server then decides wether to notify or just log.